The snails moved into their garden today. as I'm sure I've said on every post I've done about snails. tentacles stretched with eyes searching. Children are intrigued by snails. or when they touch us. And why do they look different? Some have one stripe while others have many stripes. and they'll be lost in the tall, tall grass. The children love taking care of the snails. We have a (mostly moss) garden in our sand table right now. It would be so cools to have snails there. 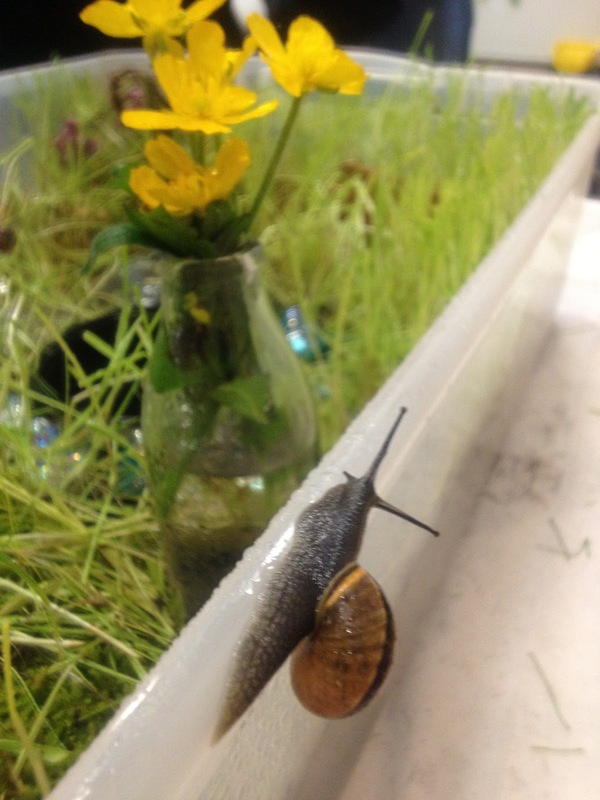 Your kids must love checking out the snails and watching them explore their garden. Sandi, it is amazing. Every morning the screen comes off the top of the garden and we count the snails, to make sure none have escaped, then we watch. Even some of the adults get a chance to overcome their fear of little slimy creatures. where did you get your snails - were they a "found in the garden" acquisition? Yes a family brought them in for us - from their garden - they were happy to get them away from their flowers. I am surprised you do not have a story about snails. Maybe you do and I just missed it. You do have the best stories! Or it's still coming, I hope to learn one soon, so keep watching.